The Articles of Confederation was the original operating document of the United States. Under the Articles, there was a weak central government with little authority to raise revenue. The Articles were written with the idea that each State was sovereign in its own right and like a little country of its own. Recognizing that each State had its own independent power, amendments to the Articles required the unanimous consent of the States. The Congress under the Confederation had little power and the Articles were almost impossible to amend. Only 11 years after the Declaration of Independence, the country was in danger of falling apart. 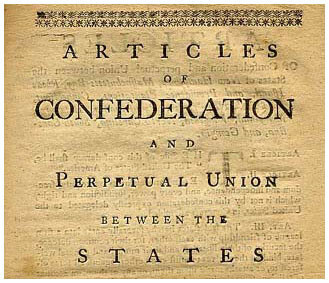 Because of these problems, in May 1787, the Confederation Congress authorized a convention in Philadelphia to propose amendments to the Articles. Instead of proposing amendments, the Constitutional Convention presented a new Constitution. Convention delegates completed their work and signed the proposed Constitution on September 17, 1787. September 17 is now observed in the United States as Constitution Day. The proposed Constitution was presented to the Confederation Congress and sent to the States for ratification late that year. The Constitution proposed a government vastly different from that under the Articles of Confederation. Perhaps the most profound philosophical changes were in the Constitution’s Articles V and VII on amendments and ratification respectively. This requirement of only nine of thirteen states for ratification and only ¾ of the States for amendments meant the individual States relinquished significant sovereignty. Any State could veto changes under the Articles of Confederation unanimous consent requirement. Under the Constitution, member States would become subordinate to the federal government and be required to accept changes a State might not approve. This change was monumental in that the States would become part of a nation rather than an alliance of independent countries. While the States would become part of a nation, subject to the Constitution’s Supremacy Clause, with the central government given exclusive powers in certain areas like immigration. The central government was limited to only the powers granted by the Constitution, with all other powers of government remaining with the States under the 10th Amendment. Understanding this division properly, it becomes clear that modern day concepts like sanctuary states do not comply with the Constitution. Governeur Morris set forth the purposes of this nation in the Preamble, with perhaps the three most memorable words in United States history: “We the People”. When the Confederation Congress sent the proposed Constitution to the States, ratification was far from certain. Each state held a special election selecting delegates for ratification conventions. This was important because the Constitution would be approved by “the people”, not the governments of the states. In keeping with the Declaration of Independence, the Constitution would be approved by obtaining the consent of the governed. Political battles were fought in every State. There was widespread campaigning between two groups, the Federalists (favoring the Constitution) and the Anti-Federalists (opposing the Constitution). Gordon Lloyd’s article, “The Six Stages of Ratification” tells this story. The first State to ratify was Delaware on December 7, 1787. Delaware’s nickname became and remains “The First State”. The Constitution became effective with the ninth state ratification by New Hampshire on June 21, 1789. Government under the Constitution began in March 1789. The States of North Carolina and Rhode Island had not yet ratified, and so were not initially part of the government established under the Constitution. The Declaration of Independence set forth the legal authority to establish the United States. Natural Law was the organizing principle. An core principle of Natural Law theory is that people consent to restrict certain natural rights in order to gain the benefits of a civil society. The ratification process established in Article VII was to obtain the consent of the people consistent with the founding principle. Gaining the people’s consent to establish the Constitution continued adherence to the Natural Law principles giving legitimacy to the government. Two Governments for Nearly Two Years? This situation raises an interesting historical legal question. Since the Articles of Confederation required unanimous approval to change, but the Constitution did not require unanimity to go into effect did the United States legally have two operating documents from June 21, 1788 until May 21, 1790, when Rhode Island finally ratified? It was with Rhode Island’s ratification that there was unanimous approval of the States to change the Articles, but the Constitution, by its terms was effective with New Hampshire’s ratification nearly two years earlier. It appears the Founding Fathers decided to overlook a few legal niceties to get the job done.